On Thursday, April 25th, the track athletes will head to Centura to compete in a quadrangular track meet. Click here to view the meet schedule for the day. On Friday, April 26th, the Methodist Church in Wood River will be hosting a Mobile Food Pantry for the community. Doors will open at noon, and food will be available until 2:00 that afternoon. Mark your calendar! Our music students have been working hard and will be presenting their spring concerts soon! Here's a schedule of their performances: Tuesday, April 30th: MS/HS Choir Concert @ 7:00pm Monday, May 6th: MS/HS Band Concert @ 6:30pm We look forward to seeing you there! Mark your calendars! The WRE Field Day will be on Friday, May 10th. The rain date is Monday, May 13th. Sports Physicals will be held from 5:30PM-7:00PM at the High School on Wednesday, May 1st for a fee of $25. Any incoming student grades 8th-12th that will participate in a sport needs a physical. Cash or Check payable to Dr. Vettel. Even though it doesn't feel like it, Spring isn't that far away! Here's some info on the Community Garden spaces offered in Wood River. WRE ASP is seeking guest speakers! 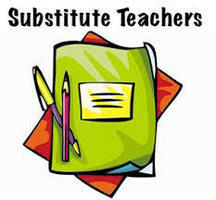 You could be a substitute teacher!